New house, extra large screen TV, comfortable couch and warm blanket! All this on a cold winter Saturday evening, with nothing else to do but relax a little. And we chose ‘On Golden Pond‘ and a glass of red wine to go with it. I bought ‘The Beautiful and Damned‘ just because I remembered that I enjoyed somewhere in high-school ‘The great Gatsby’. The introduction said that the action happens in the same era, so I said why not. I didn’t have too many expectations from this book, I imagined I would enjoy reading it, but in the end I actually loved it. I saw Evil some years ago and somehow it got to my attention again a few days ago, as a friend of mine reminded me of it. I didn’t remember exactly what the story was about, so I decided to watch it again. The title of this book made me laugh, the first time I heard about it. 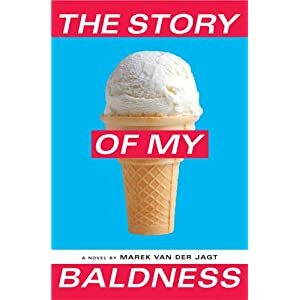 Then I read that ‘The story of my baldness‘ written by Arnon Grunberg, was banned in the Netherlands for quite some time and so it got to my attention even more. And here I am, buying the book and finishing reading it after one week. The NY label from Veronica Vasicka, Minimal Wave present on their 35th release, a full length LP entitled “Clean Tables Have To Be Burnt” by UK legends Hard Corps. I saw this movie a couple of weeks ago and I was really happy to see that it was nominated to this year’s Oscar awards, after a brilliant last year with participation in most of the international film festivals where it succeeded in winning no more and no less than 35 awards. Reissue for this super-rare space funk album from 1983, one of the holy grails of the Cosmic scene. Extremely expensive and hard-to-find in the original.